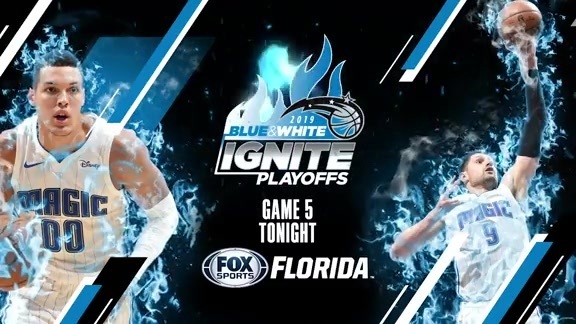 ORLANDO – Lost in the hysteria and hype of the Orlando Magic’s furious fourth-quarter rally and Evan Fournier’s clutch, game-winning shot on Monday was a stellar defensive play made by center Nikola Vucevic that made the victory possible. Magic coach Steve Clifford noted on Wednesday that it’s only fitting that Vucevic’s defensive contribution was overlooked considering how his improvement on that end of the floor has mostly flown under the radar thus far. Still, Clifford said others throughout the NBA are starting to take notice of the strong play and major improvements that Vucevic has made in the Magic’s defense this season. Vucevic was very, very good for the Magic at the end of their game against the Cleveland Cavaliers on Monday. With the game knotted at 100, George Hill – who had scored 22 points and made seven straight shots in the second half – came off a high screen and challenged the 7-foot Vucevic only to have his shot completely stuffed by the Orlando big man. The rebound ended up bouncing off of Hill, giving the Magic the ball and setting the stage for Fournier’s buzzer-beating winner. Not only is Vucevic leading the Magic in rebounding (10.5 rpg.) – something he could do for a seventh consecutive season – he is swatting 1.3 shots a game. If it holds up, that would be a career high, bettering his 1.1 blocks per game in 2015-16 and 2017-18. His steadiness inside has helped Orlando climb to 15thin the NBA in points allowed per game and 18thin field goal percentage allowed (through Tuesday night). CELEBRATION HUMOR: In the hours and days after Fournier’s game-winner on Monday night, Vucevic was on the receiving end of some good-natured humor from his teammates. While Fournier brazenly stared into the crowd following his game-winning shot, Vucevic celebrated by charging toward his teammate for a happy hug. Photographs of the scene showed Vucevic with an elated, toothy smile on his face as he ran toward Fournier to celebrate. ``We had a group chat going around that night with a picture of Vooch, clowning him and making fun of him,’’ Magic veteran point guard D.J. Augustin said. Augustin also had a comment about Fournier’s stone-faced look after he drilled the 24-footer that won the game. Vucevic has made two buzzer-beating, game-winners in his career – Nov. 11, 2015 against the Lakers and Feb. 7, 2016 versus the Hawks – and his reaction was dramatically different in the two of them. After drilling a turnaround jumper from the left wing against the Lakers, Vucevic sprinted down the floor with his right arm raised. 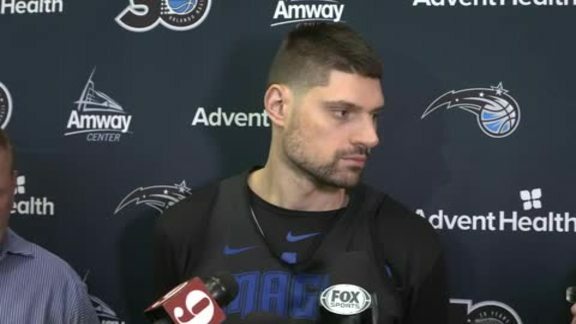 Against the Hawks – after burying a shot from the same spot on the Amway Center parquet floor to beat the Hawks – Vucevic stood in place and glared ahead as he was mobbed by teammates. He defended his reaction to Monday’s winner, saying he was caught up in the emotion of the moment. RARE RALLY: When Fournier missed a 3-pointer with 33 seconds remaining in Monday’s game, leaving the Magic in a 100-95 hole at the time, the website Inpredictable.com, had their odds of losing at 98.6 percent. Of course, Orlando proceeded to pull of the comeback by scoring the game’s final seven points over the final 23.8 seconds. How rare is that? According to SportRadar.com, the Magic haven’t won a game that they trailed by five-or-more points in the final 30 seconds since Dec. 9, 2008. That night nearly 10 years ago, Orlando wiped out a five-point deficit in the final 30 seconds by getting 3-point shots from Hedo Turkoglu and Rashard Lewis to beat Portland, 109-108. On Monday, Orlando was saved by an Aaron Gordon turnaround jumper, three free throws from Augustin and Fournier, two Cleveland turnovers and Fournier’s buzzer-beater. UP NEXT: The Magic will be back on the practice floor on Thursday as they prepare for the first meeting of the season with the slumping Washington Wizards. Orlando will host the Wizards at the Amway Center on Friday, and then the two teams will play again three nights later – this time in Washington, D.C. The Wizards started the season 1-7 before beating the New York Knicks on Sunday. Washington, which has a bottom-five ranked defense in nearly every major statistical category, was throttled 119-110 in Dallas on Tuesday. Center Dwight Howard, who is on his sixth team since leaving the Magic in 2012, has played just three games after suffering from gluteal soreness early in the season.